Specific CL treatment includes local, oral, and parenteral agents. Local treatments include topical paromomycin and paromomycin-gentamicin, which have been shown to be effective treatment for CL in a randomized controlled trial. Other local treatments include intralesional antimony, cryotherapy, thermotherapy, and selective irradiation. An oral treatment, miltefosine, is the only therapeutic agent approved by the U.S. FDA for CL. Oral azoles can also be used. The primary parenteral agents are the pentavalent antimony compounds: sodium antimony gluconate (stibogluconate or Pentostam) and N-methylglucamine antimoniate (meglumine antimoniate or Glucantime). Either can be used. There are no controlled prospective trials to evaluate their use, but they are felt to be equally effective. These are not FDA-approved in the United States, but stibogluconate is available through the U.S. Centers for Disease Control and Prevention (CDC). These compounds must be given intramuscularly or intravenously. Adverse drug effects include nausea, headache, malaise, and arthralgias. ECG changes can include QT prolongation and ventricular arrhythmias. Renal failure, pancreatitis, and elevated LFTs have also been described with rare deaths. Baseline labs and ECG should be obtained and done weekly during therapy. Parenteral amphotericin B, liposomal amphotericin B or pentamidine can be used in patients who do not tolerate the antimony compounds or when resistance has been documented. For mucosal leishmaniasis (ML), recommended treatment is a prolonged course of pentavalent antimony compounds Pentoxifylline can be added to antimony compounds to modulate cytokine activity. Close clinical monitoring is essential. Visceral leishmaniasis (VL) is a serious systemic infection. The preferred treatment is liposomal amphotericin because of its efficacy and relatively favorable safety profile. Conventional amphotericin B can also be used, as can pentavalent antimony compounds. However, pentavalent antimony compounds should not be used to treat VL from India or Nepal because of documented resistance. Second line agents include miltefosine and paromomycin. Miltefosine is now commercially available as Impavido® (Paladin Therapeutics, Inc). Topical paromomycin can be obtained through a compounding pharmacy. Evaluations of combination therapy are ongoing, but there are limited current data to guide this use. Patients coinfected with HIV and VL should have treatment of both HIV with HAART and VL. Some of the alternate treatments have not been evaluated in treatment of all Leishmania species. 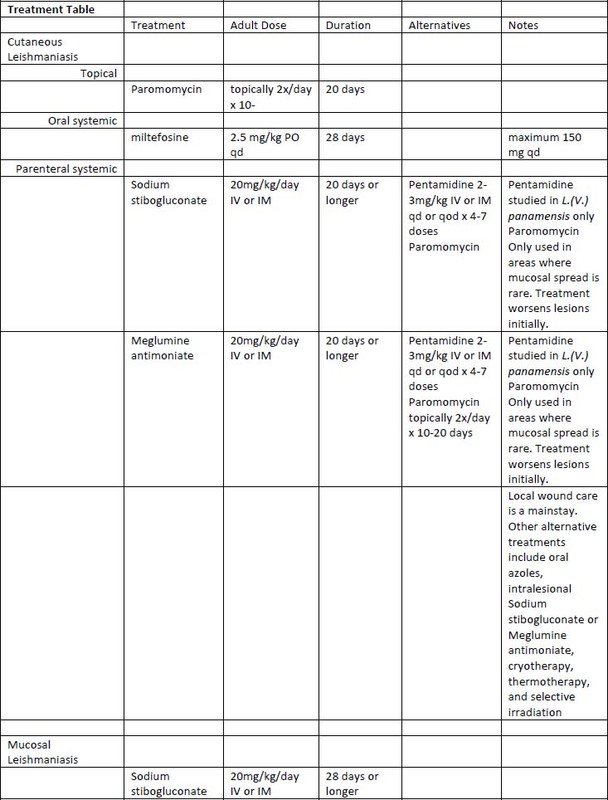 Please see the treatment table (Table I) for recommended doses and duration. What are the clinical manifestations of infection with this organism? Cutaneous leishmaniasis can be divided further into several syndromes; for all of these syndromes, the primary symptoms are single or multiple skin lesions. Localized cutaneous leishmaniasis (LCL) begins as a red papule that enlarges to form a granulomatous, painless ulcer, which may resolve without treatment, leaving a scar. Causes are L. major and L. tropica in the Old World, and L. braziliensis, L peruviana, L. guyanensis, L. panamensis, L. amazonensis, and L. mexicana in the New World. Diffuse cutaneous leishmaniasis (DCL) is rare and usually seen in patients with deficient cell mediated immunity. Species associated include L aethiopica in the Old World, and L. mexicana and L. amazonensis in the New World. Nodules form as amastigotes disseminate to other areas of skin, and can lead to disfiguring lesions over time. Mucosal leishmaniasis (ML) primarily occurs with L. braziliensis and is seen only in the New World. Most common areas affected are the nose and mouth. A new mucosal lesion can follow a primary cutaneous lesion even years later (called espundia). Disfigurement can be severe if the nasal septum is destroyed. Kala azar (black fever) has gradual onset of malaise, fever, weight loss, abdominal pain, and right upper quadrant fullness. Severe anemia can occur since the reticuloendothelial system has high parasite loads. In patients from the Indian Subcontinent, skin darkening occurs (hence, the syndrome name). In late disease, hepatic dysfunction, cachexia, and ascites can occur and bleeding complications can arise from thrombocytopenia. Disease is uniformly fatal without treatment, and even treated cases have 10% mortality. Mortality is increased in patients coinfected with HIV or tuberculosis. Kala azar in pregnancy can cause congenital leishmaniasis or fetal demise. Post kala azar dermal leishmaniasis is characterized by chronic skin lesions (plaques or nodules) after clinical response to treatment of L. donovani. Viscerotropic disease is a systemic illness due to L. tropica infection that is much milder than kala-azar and includes fever, abdominal pain, adenopathy, malaise, and lymphadenopathy. Treatment with sodium stibogluconate can be considered or some patients recover without specific treatment. Physical exam findings include cutaneous and mucosal lesions as noted above. In VL, splenomegaly and lymphadenopathy are common findings and others are noted above. Do other diseases mimic its manifestations? Cutaneous leishmaniasis must be differentiated from sporotrichosis, blastomycosis, cutaneous tuberculosis, atypical mycobacterial infections, syphilis, yaws, leprosy, sarcoidosis, discoid lupus, and neoplasms. Mucosal disease can be mistaken for paracoccidioidomycosis, sarcoidosis, malignancy, yaws, syphilis, and histoplasmosis. Acute visceral leishmaniasis is indistinguishable from other diseases, such as malaria, schistosomiasis, acute Chagas’ disease, tuberculosis, and typhoid fever. Chronic VL may look like brucellosis, hepatosplenic schistosomiasis, hematological malignancy, and chronic malaria. For cutaneous and mucosal disease, the complete blood count (CBC) is generally normal. In VL, there can be anemia, leukopenia, thrombocytopenia and eosinophilia. In VL, liver enzymes may be elevated, and there may be hyperbilirubinemia. Albumin may be decreased, and there can be increased gammaglobulins due to B-cell activation. For cutaneous and mucosal disease, an aspirate, scraping, or biopsy of the lesion should be obtained. For aspiration, the lesion should be cleaned and then normal saline injected and withdrawn in 3 – 4 areas of the lesion. Biopsies of cutaneous lesions can show a range of findings from pronounced granulomas with few organisms to many organisms in macrophages. The parasites are visible with Giemsa or Wrights stains and have a dark, eccentric nucleus and a small red structure called a kinetoplast. It is not possible to distinguish Leishmania species by morphology. Culture can be performed on NNN medium or Schneider’s medium at 28°C. Cultures should be maintained for 4 weeks, as the organism may be slow growing if there is a low parasite load. Serology is not generally helpful in cutaneous disease, and polymerase chain reaction (PCR) is not yet widely available. In VL, aspirate or biopsy of bone marrow or spleen has the greatest yield. Of the two sites, BM aspirates have lower overall complication rates. Aspirated material should be divided into portions for culture, staining, and tissue sections and touch prep. Culture and histology are performed as for cutaneous disease above. Serology can be helpful in VL, but must be interpreted in the clinical context, as both false positives and negatives can occur. Both immunofluorescence assay (IFA) and enzyme-linked immunosorbent assay (ELISA) are useful, and the Direct Agglutination test (DAT) can be used in resource limited settings. A review of rapid tests for VL found that one, the (rK39) immunochromatographic test (ICT) had good accuracy for the diagnosis of VL in patients from South Asia. In patients coinfected with HIV, in whom antibody titers may be low, nucleic acid amplification tests (NAATs) have good yield given relatively high levels of parasitemia. Other tests, such as a urine antigen test and Leishmanin skin test, are generally not useful for diagnosis. Post kala azar dermal leishmaniasis is diagnosed with histology, culture, or NAAT of tissue specimens. What imaging studies will be helpful in making or excluding the diagnosis of leishmaniasis? Imaging is generally not helpful to the diagnosis of leishmaniasis, unless needed for supportive or diagnostic management (e.g., abdominal ultrasound or CT prior to splenic aspiration or paracentesis). What complications can be associated with this parasitic infection, and are there additional treatments that can help to alleviate these complications? There is a mortality of 10% associated with treated kala azar if disease is severe. Significant complications can occur with VL, including post-kala azar dermal leishmaniasis. Congenital infections can occur with VL infections in pregnancy. Severe deformities can result from cutaneous or mucosal lesions of the face and oral or nasal mucosa. What is the life cycle of the parasite, and how does the life cycle explain infection in humans? What is the epidemiology of leishmaniasis? The organism exists in two forms. The extracellular promastigote in the gut of the sandfly vector is injected via bite into the host skin where they are taken up by macrophages and transform into intracellular amastigotes. They then either multiply locally or disseminate throughout the reticuloendothelial system. The key vector is the female sandfly – species Luzomyia in the Old World and Phlebotomus in the New World. Those exposed to sandfly bites are at risk. The global incidence is likely increasing due to increases in rodent populations, which are a reservoir for some Leishmania species, increased numbers of immunocompromised hosts, migration and urbanization due to war and economic collapse, and decreased insecticide use. The overall prevalence of leishmaniasis is thought to be 12 million cases worldwide, and it is found in all continents, except Australia and Antarctica. Infections can occur as sporadic outbreaks or are endemic in other parts of the world. There is no significant seasonal variation. Areas in which humans are in close contact with each other and with rodents and sandfly vectors create ideal conditions for transmission. Strategies to control sandfly populations with insecticide or to reduce rodent populations are costly and difficult to sustain. Prophylaxis is currently not recommended. There is currently no human vaccine available. Wearing insect repellant and protective clothing helps avoid sandfly bites. WHAT’S THE EVIDENCE for specific management and treatment recommendations?